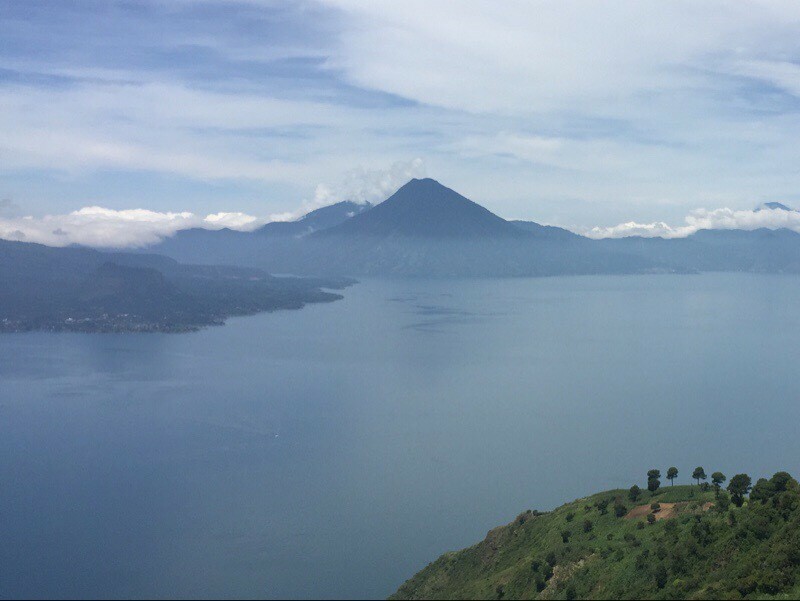 When we mentioned to people that we were going to Guatemala, anyone who had been here immediately said “You have to go to Lake Atitlán”. They said it enough times that I began to believe they were right. We decided that after a week in Antigua going to Spanish School, it would be nice to chill out at the lake for 5 days. They were right: it’s an amazing place. Here’s a little history and context for you thanks to our amigo, Wiki. 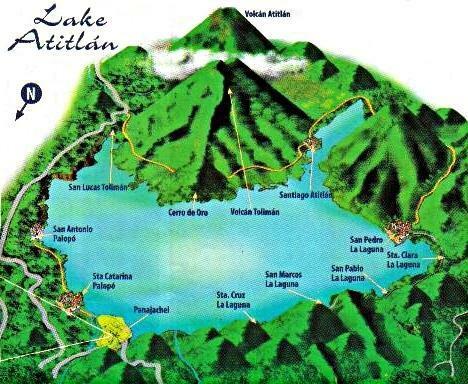 Lake Atitlán is the deepest lake in Central America with a maximum depth of about 1,120 feet. It’s surface area is 50 square miles. 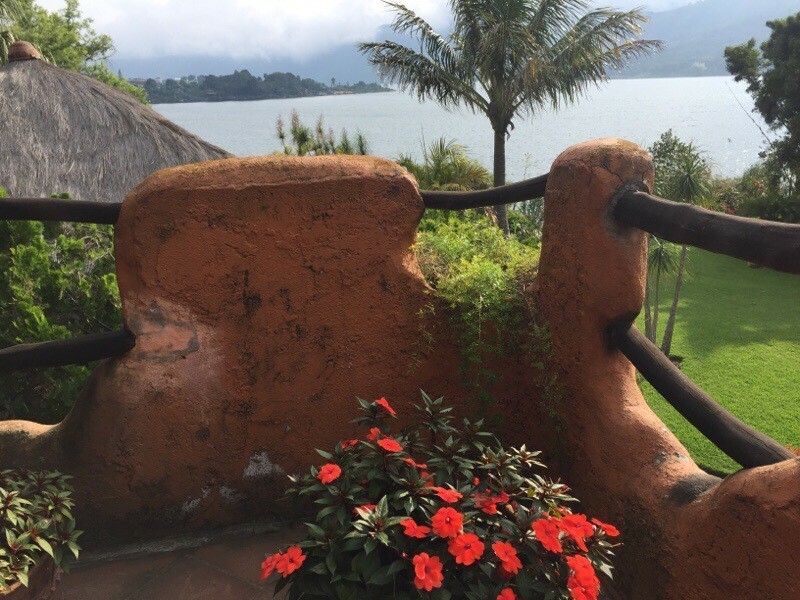 Atitlán feeds into two nearby rivers rather than draining directly into the ocean. It is shaped by deep surrounding escarpments and three volcanoes on its southern flank. The lake basin is volcanic in origin, filling an enormous caldera formed by an eruption 84,000 years ago. The lake is about 31 miles west-northwest of Antigua. 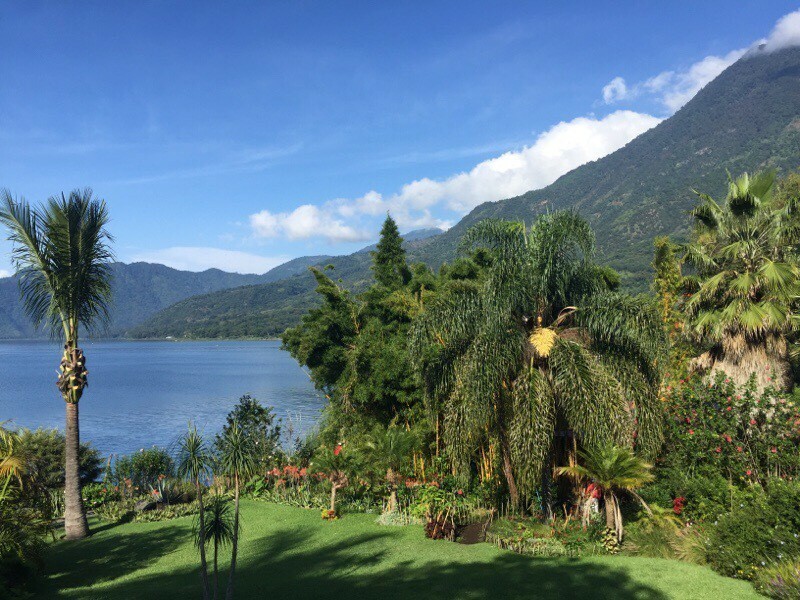 Lake Atitlán is known as one of the most beautiful lakes in the world and is Guatemala’s most important national and international tourist attraction. Ok, now that we got that out of the way, let’s clear something up. 31 miles from Antigua is as the crow flies. Not as the shuttle bus flies. 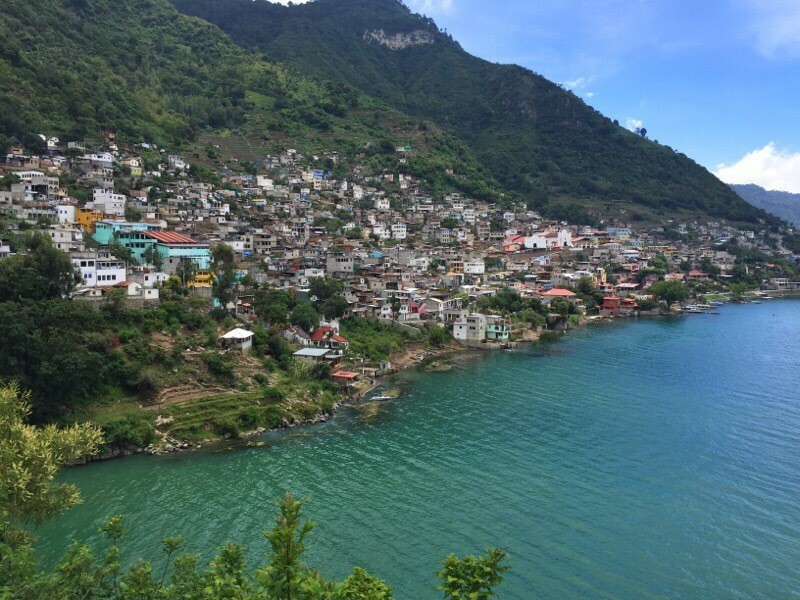 It took about 3 hours to get to Panajachel, which is the biggest town on the lake and the most direct one to get to from Antigua. And this was not 3 hours of a relaxing drive where you chat and watch the scenery. There are a few spots of highway but its mostly small town after small town. Which means speed bumps galore, both man-made and natural (potholes). It was so bumpy that my Fitbit was convinced I walked a LOT that day. But I did not. Sadly. Everyone was a little green in the face by the time we arrived. The good news is that coming back we took a more direct route to Antigua and it was not as bad and only took about 2 hours. Still pretty windy, though. Mountains will be mountains. That blue area is the lake! Not too far from Antigua, where we were last week. Far enough to get carsick, however. 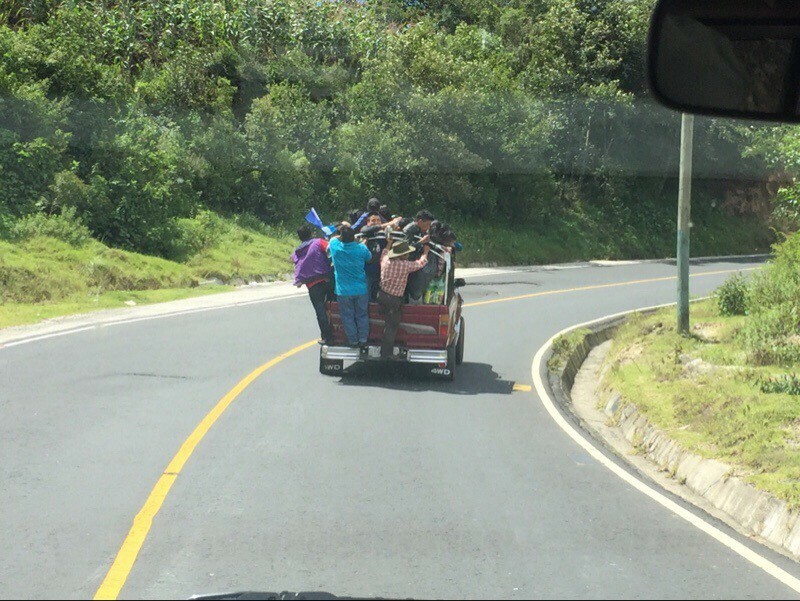 This is one “bus” option around here, A pickup truck stuffed with people. This was the good part of the road. We watched intently as they hit a speed bump. A map of all the towns along the lake, and you can see the three volcanoes. One of the things that’s so interesting about the lake is all the towns that are perched (and I mean perched) on it. 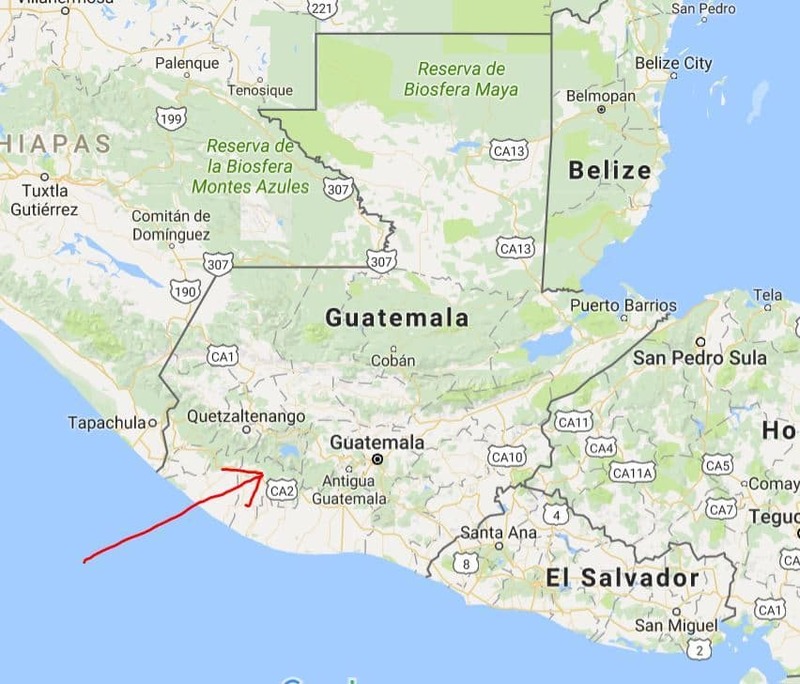 Each town has a different identity dating very far back to their Mayan days and much earlier than when the Spaniards arrived. 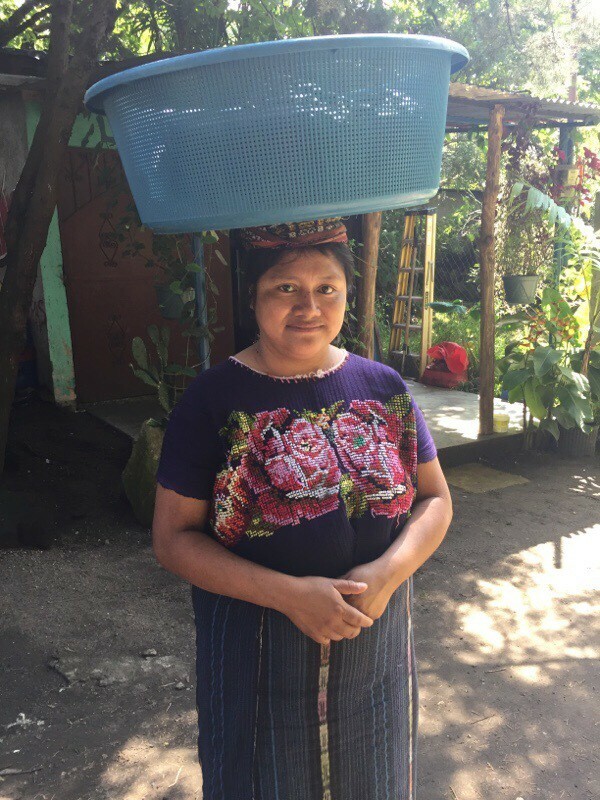 The women (and a few men but not many) wear the traditional traje, which is a blouse and/or poncho and/or outfit that is specific to that town. Our driver took us first to San Antonio and we could see that the traje there was a pretty blue blouse with lines. The trajes tend to have specific colors with geometric patterns, sometimes in the shape of animals that they feel are representative of their culture. I was trying to look like a model but I only succeeded in looking like a mannequin headed for surgery. This is the town of San Antonio. You can see how the houses just go up on the hillside. There’s a lot of stairs and hills in these towns. And by “stairs” usually I mean “dirt paths that are at an incline”. 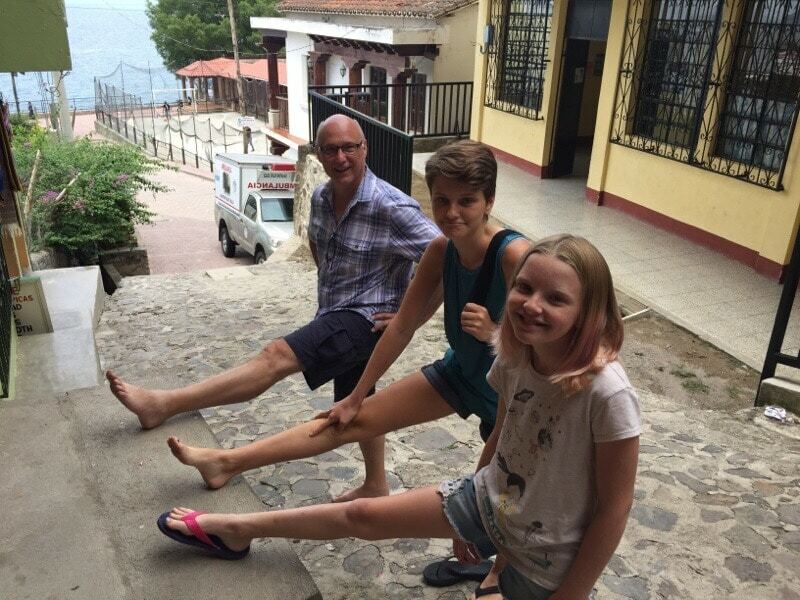 Jay and the girls getting their stretch on before climbing all the stairs in San Antonio. We were trying to get back in the van in San Antonio but the vendors were getting very anxious about us departing without buying anything. Jay did want something for his wife so he and Aaron are paying for the blue fabric before fleeing. 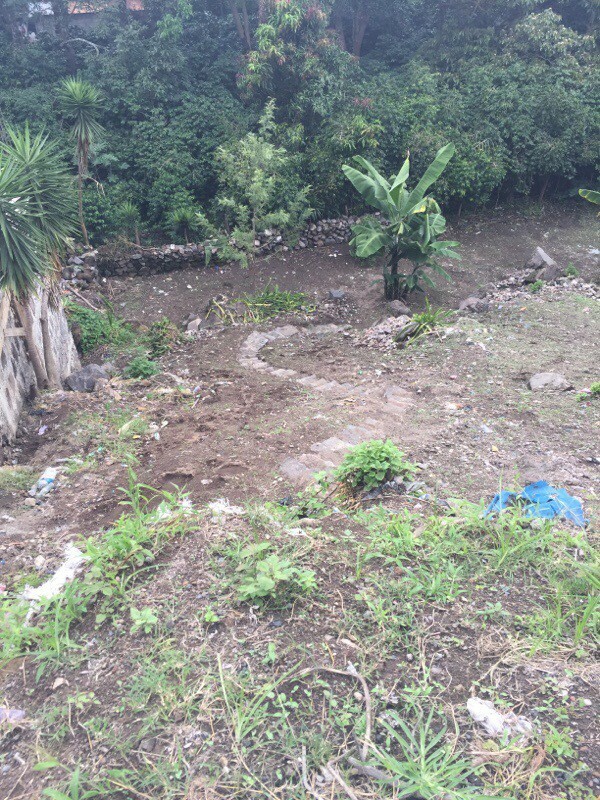 But we moved along and drove to Panajachel. There we had lunch and drove down the very very long street that was the market. It had everything under the sun, but especially these gorgeous textiles that they make here. 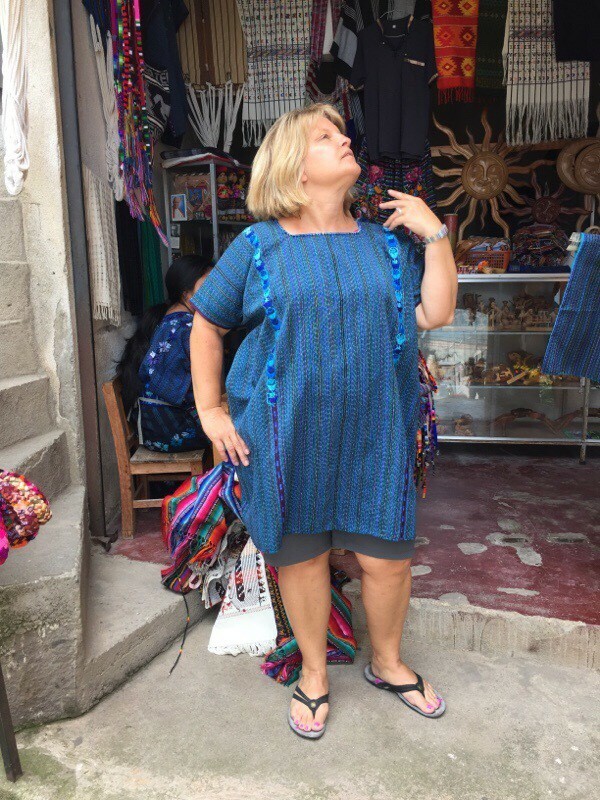 We were not staying in the town of Panajachel so we went to the port and caught a water taxi to Santiago, where we had a hotel room booked for the week. Our friends Jay and Aaron were going back to Antigua the same day, but they decided to check out the hotel and came along for the ride. The lake. Around that bend in the middle of the picture is Santiago, where we are staying. That volcano in the middle towers over our hotel. The Shermans and Jay and Aaron! You can see the two volcanoes but I think Jay is obscuring the third one. Zoe taking in the view on the way to the lake. 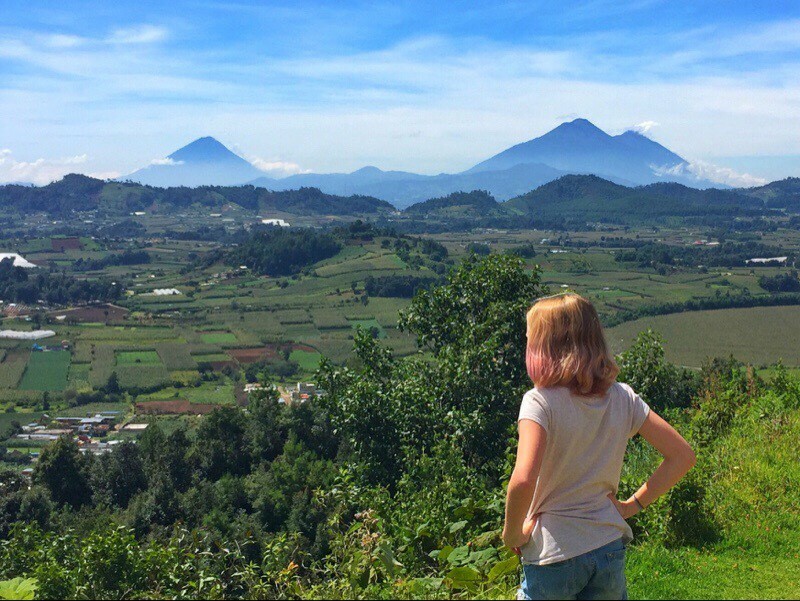 You can see all the crops and the three peaks of the volcanoes. The hotel (Hotel Bambu) is quite lovely, there’s a dock right on the water so we were taken right to it and settled into our one-room, one-bathroom suite. We don’t love hotels due to their limited space but this one is pretty nice on the surface, but with a few improvements that could be made that you don’t really realize until you’ve settled in. When we need towels or toilet paper, Zoe is our runner. With no phones to call the front desk you do what you have to do. Or Zoe does. 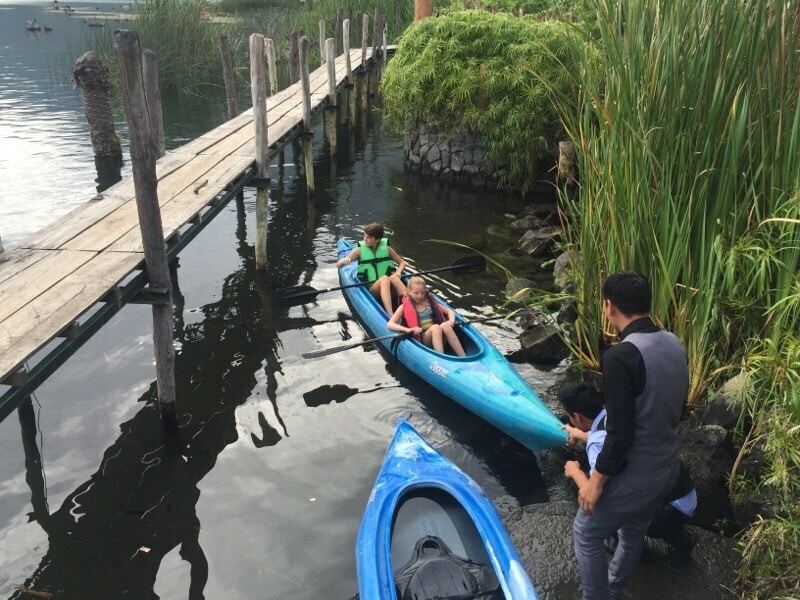 The girls loved the hotel for the lush gardens, 3 dogs who live on the property, the yummy hot chocolate and most of all the free kayaks. In two days they’ve gone out 3 times. I love that they are 1) enjoying something together and 2) outside in the fresh air and 3) doing something active. I love it so much that I agreed to skip homeschool when they asked to have time for kayaking. Sisters kayaking is 1) team building 2) physical education and 3) a lesson in physics (e.g. how not to tip over). That’s how we roll with homeschool, y’all. 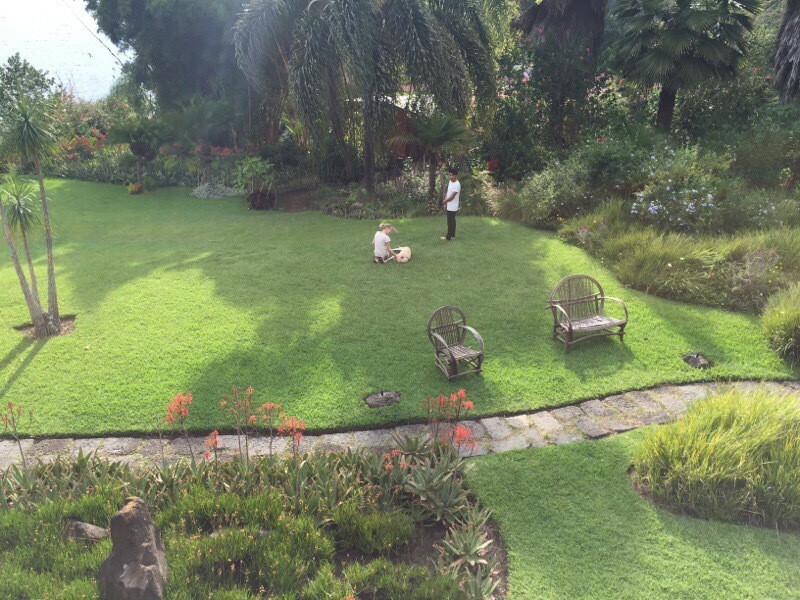 Looking down on the gardens of our hotel. Zoe is petting one of the dogs. View of the lake from our balcony, which has a nice sitting area. We call it the “living room”. The girls are setting out on their daily kayak trip. The staff are amused. The girls and I are standing by the reception and restaurant of our hotel. 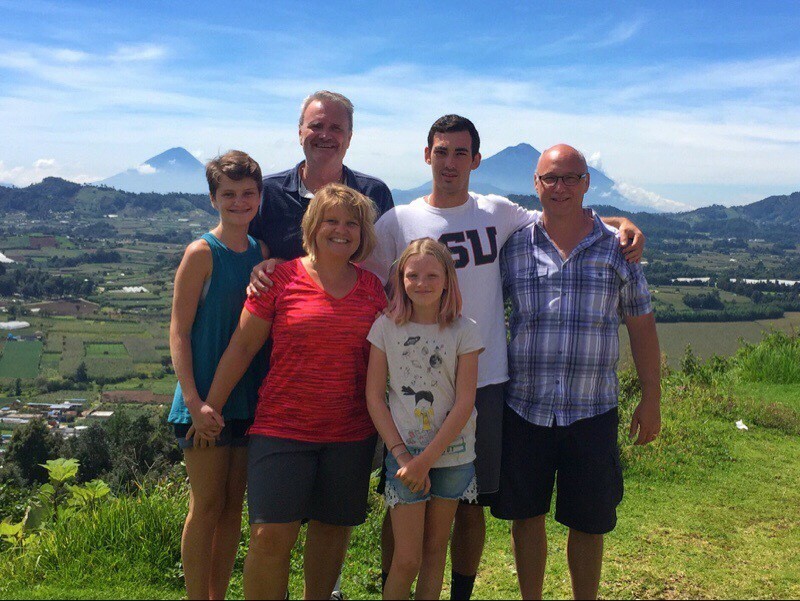 The volcano tip is not always visible so this was a good time for a picture. Speaking of the weather, can we talk about perfection, please? There is no need for heat nor A/C in our hotel room. The weather is gorgeous… all the time. You (read: us tourists) wear shorts, t-shirts and flip flops all day and other than after the possible rain storm in the afternoon, you are not cold. No sweating! No freezing! It’s absolutely lovely. 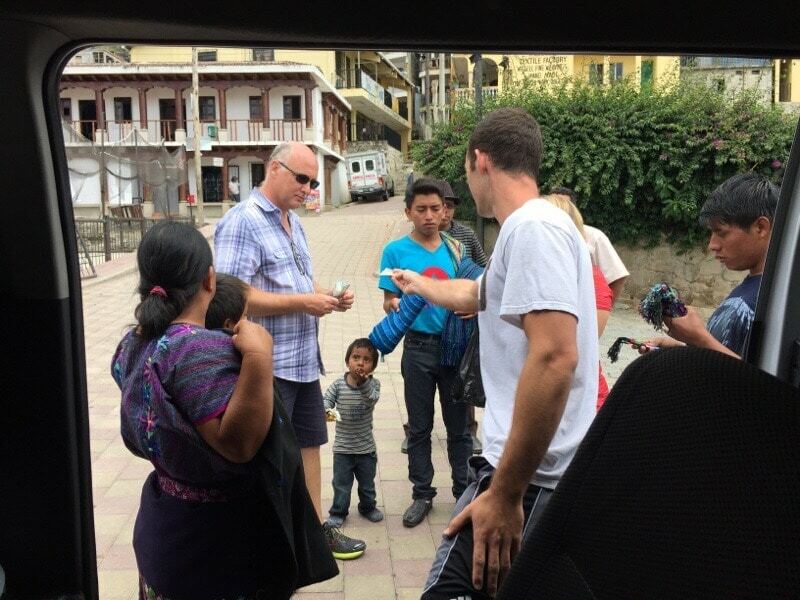 As I type this Dan is researching real estate on Lake Atitlán. Just “researching”, he says. There are not a lot of high impact things to do on the lake but we are taking it all in and enjoying the down time too. 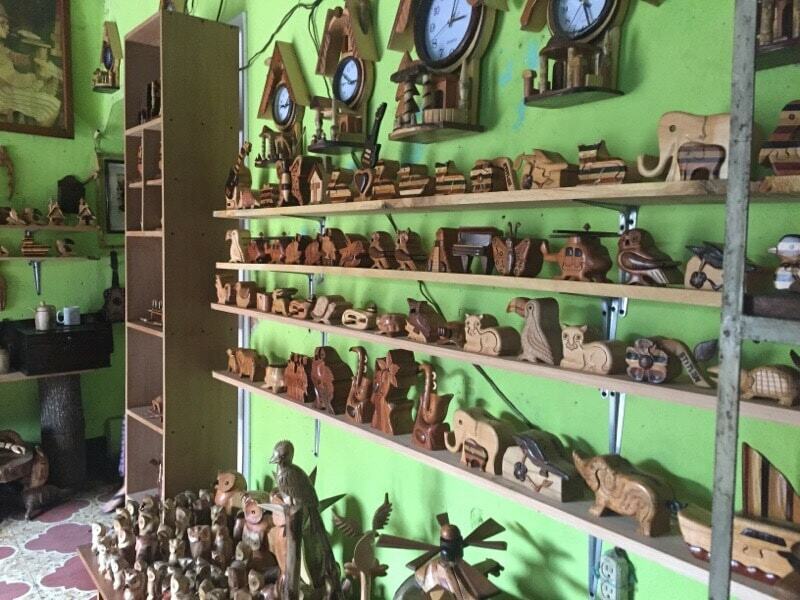 The town where we are staying is known for it’s artisans so we have enjoyed walking down the street checking out the beautiful textiles and wood working. Supposedly there are 65,000 people who live here, which is almost double the size of Antigua. We honestly have no idea where they are because the town seems relatively small. But it’s sweet. Boxes with secret drawers. I love them! The details are amazing. 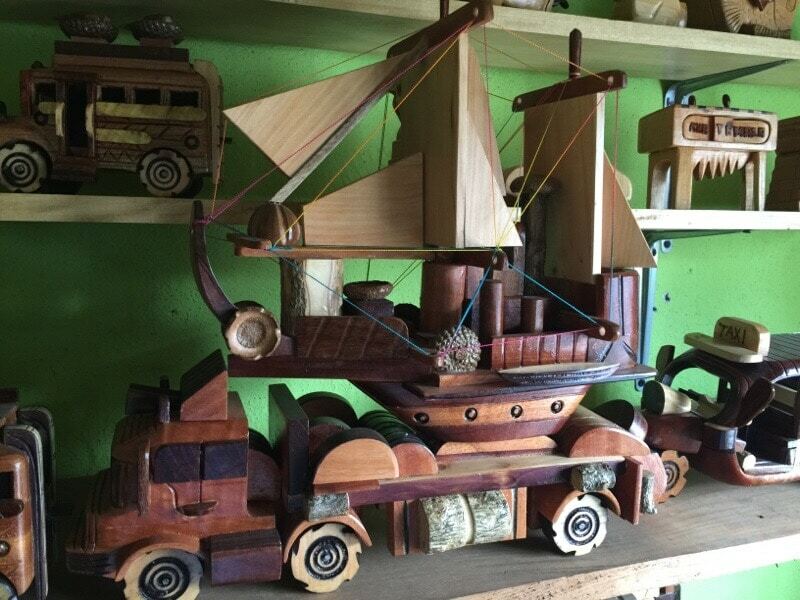 This one has secret compartments too. 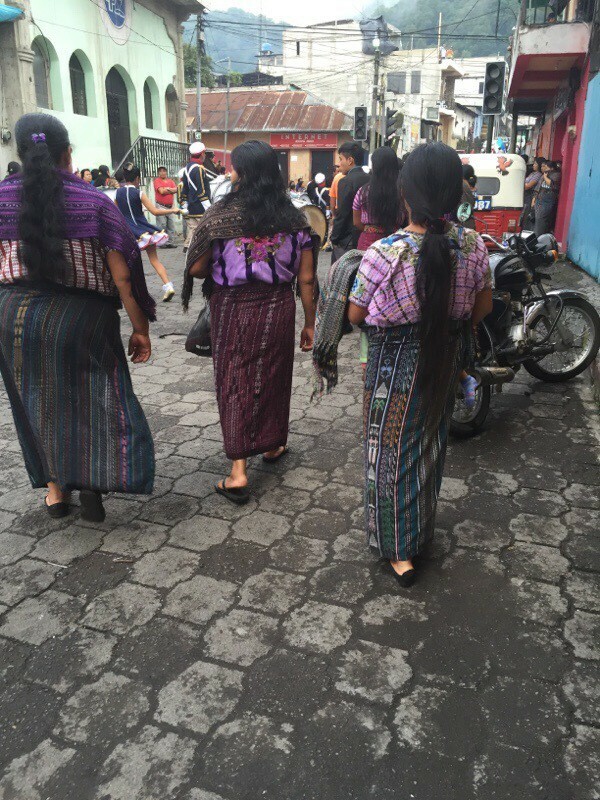 The women in Santiago go about their day in their traditional traje. They don’t wear them for the tourists, it’s what they wear. I was very taken aback on my way to my morning cappuccino. A group of women were walking together, about 20 of them, and I was struck by how they all looked alike. They were wearing pretty much the same outfit, at least to an untrained eye. They were all the same height, of very similar body shape, same hair color, all worn in the same style and the same skin and eye color. I can see why they might be fascinated with people from other cultures, since we all look so different, both from them and from each other. Zoe gets a lot of stares everywhere she goes. They just move out of the way for Dan. He’s a giant here. More so than usual. The museum was closed the day I went but I got this picture from the window. 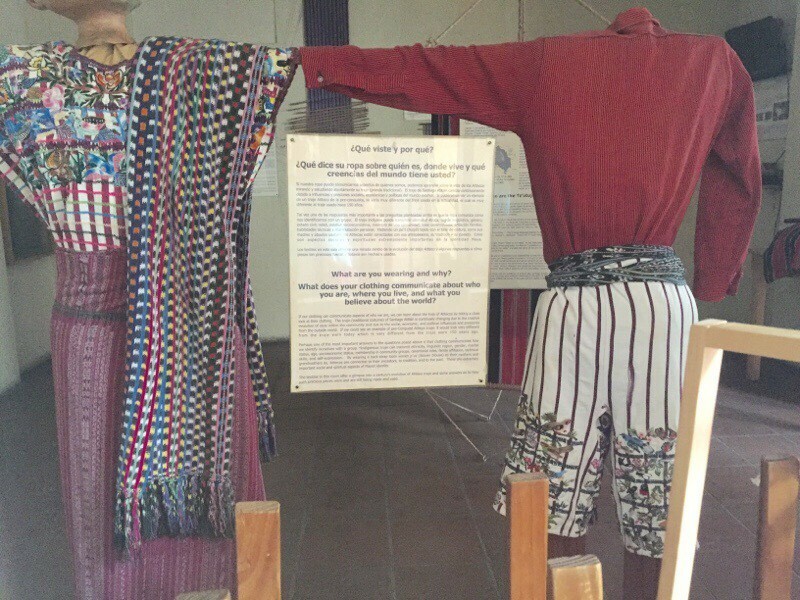 The traditional traje changes over time, but it also has variations to represent things like language, gender, home town, and marital status. Here is a traditional traje (from the back) for a man and woman. I got this picture from the back so as not to be too obtrusive. 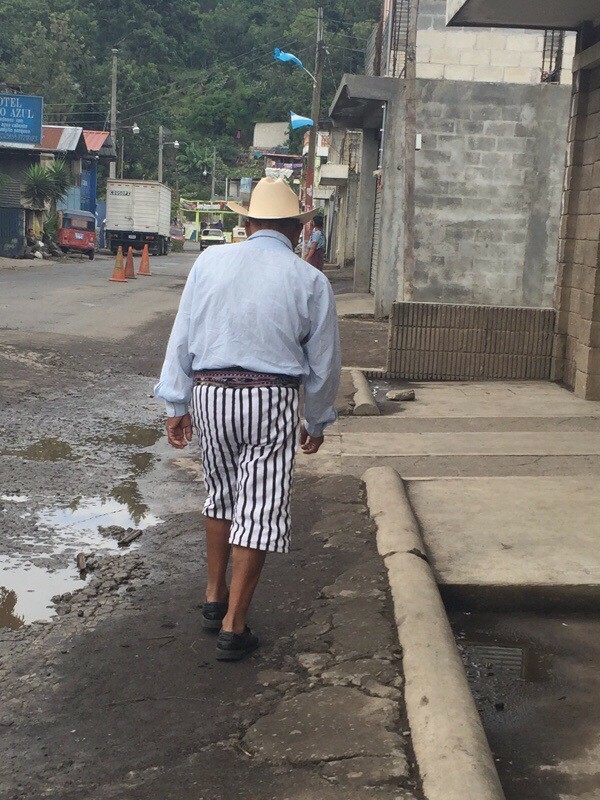 Just an average guy walking down the street of Santiago. It’s also very interesting that Spanish is the second language for most people here. Many of them speak Spanish well, but slowly and carefully. I hear them speaking to each other in a different language, a Mayan dialect. I’ve never been in a place where so much is unchanged from hundreds of years ago. And yet, the gal behind the counter at the store was wearing a traditional traje while using her iPhone 6, so it’s not like we aren’t living in the present time either. It’s a bit crazy to wrap your head around it. We’ve enjoyed our week on the lake. It’s been relaxing but also incredibly interesting as well. 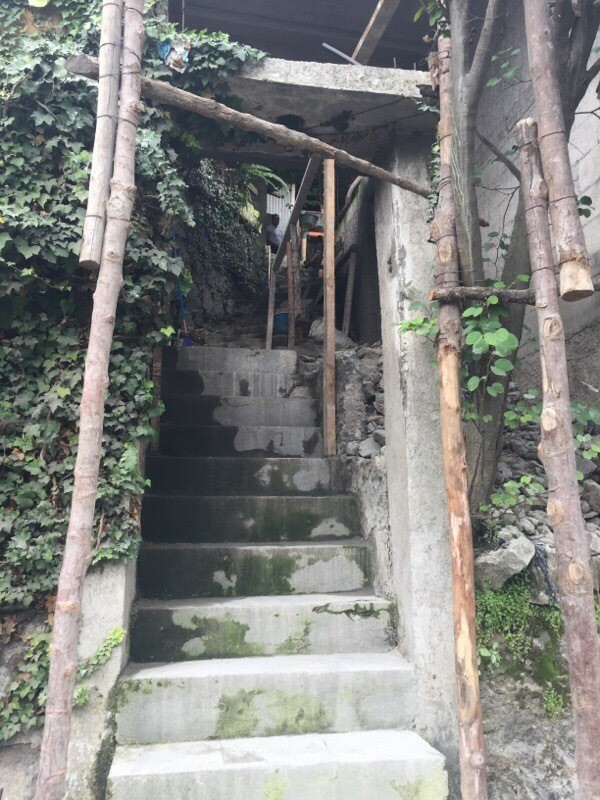 Here are a few more pictures to help you get a feel for the place. 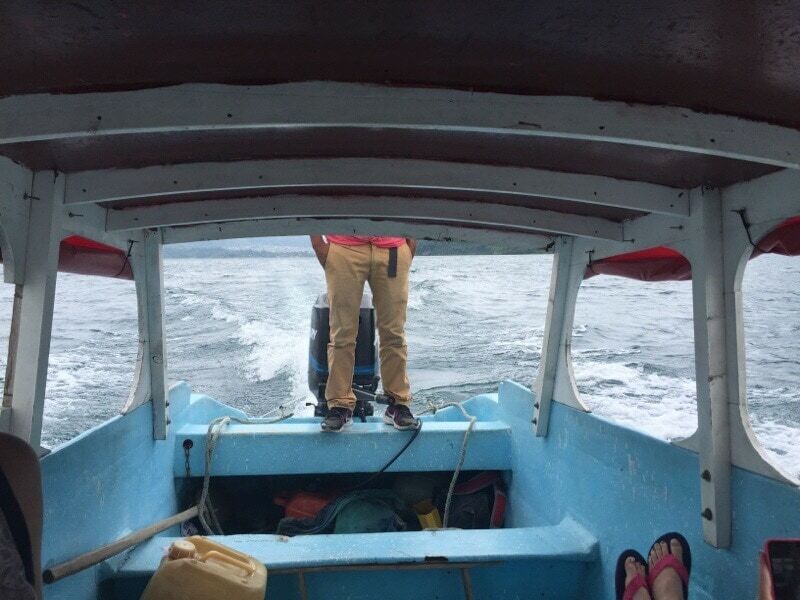 We were impressed with our water taxi captain. Look, ma! No hands! We went to another village on the lake to meet a fellow Worldschooling family. 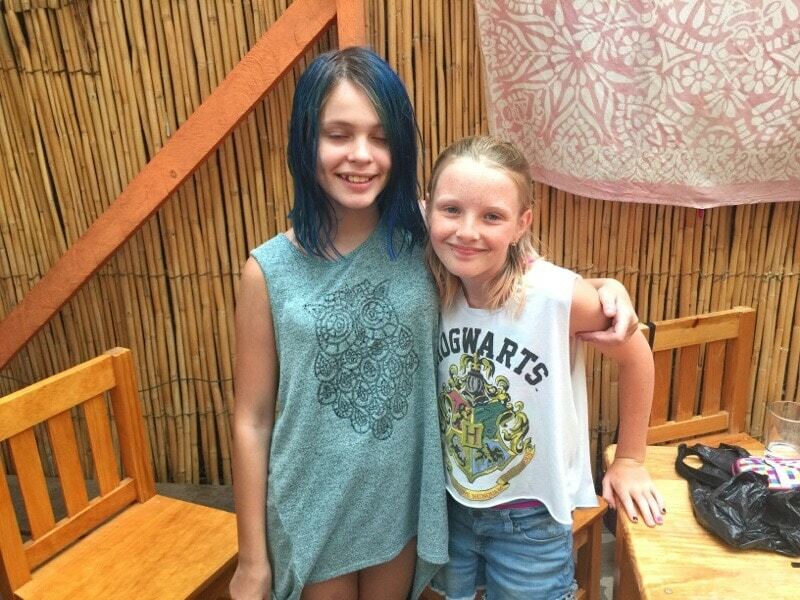 Our kids became fast friends. I have so many pictures of this lake. It’s just so pretty. 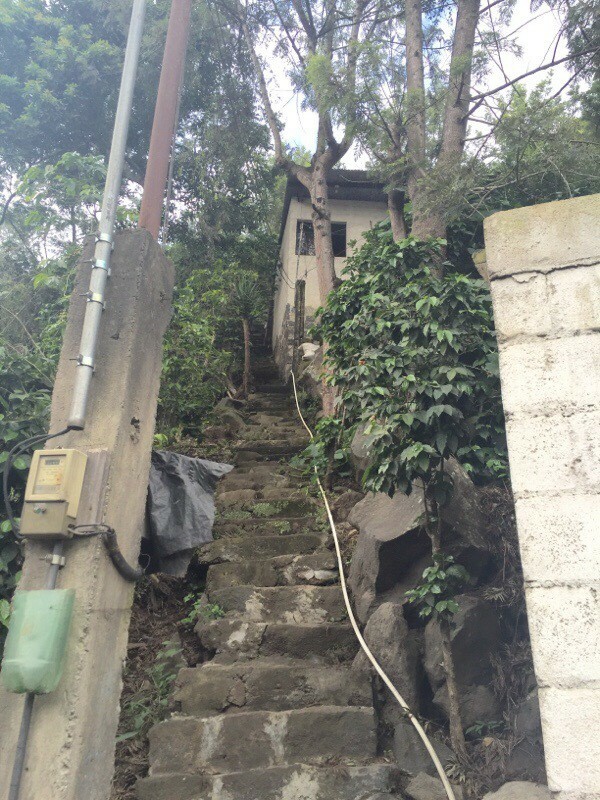 This are pretty average stairs headed up to someone’s house. More stairs. They continue going up and to the right. A path going down to some houses on the other side of the trees. 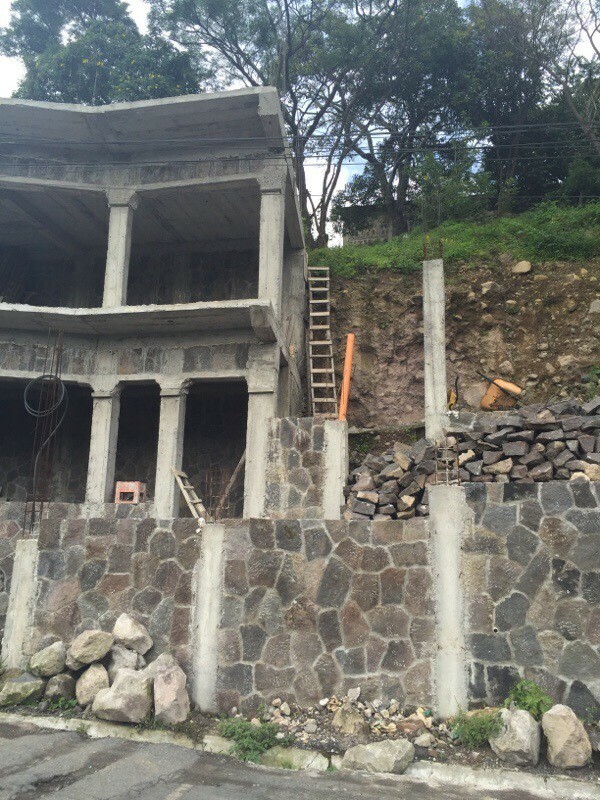 Building a house into the cliff. They are all like this in the towns around the lake. Milk delivery at a coffee place. 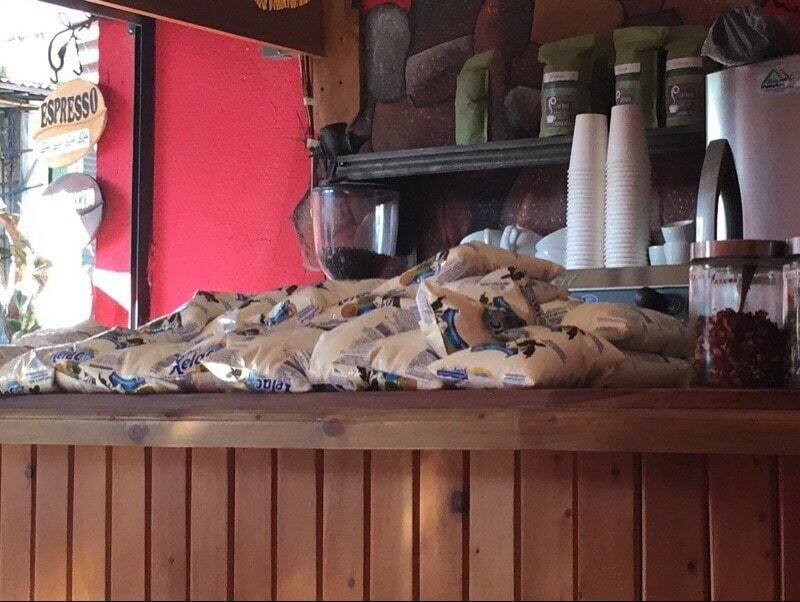 Many many bags of milk! They sell water in bags too. I passed this lady on the street and I just could not help myself. I stopped her and complimented her on her blouse and asked if I could take her picture. She was sweet and obliged. I asked if I could give her a tip in exchange for the picture and she graciously accepted. I think she was headed to do laundry at the lake. 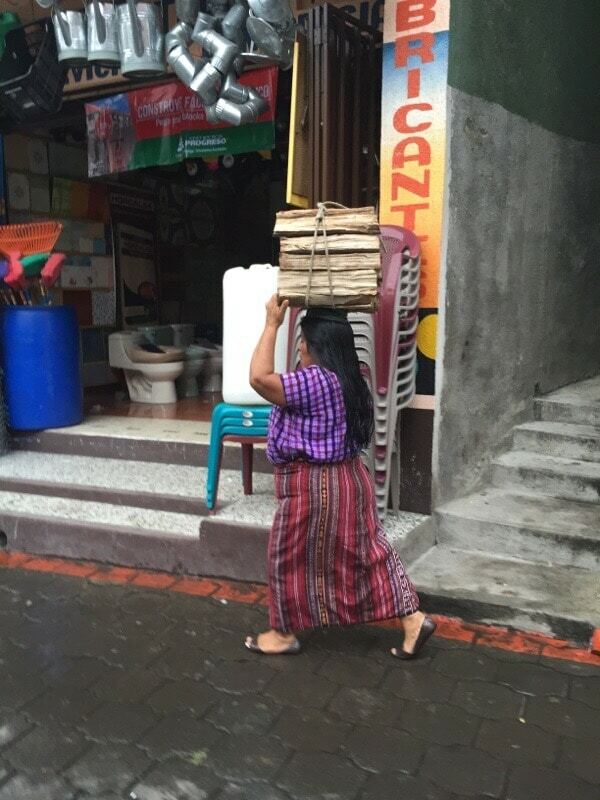 Carrying things on your head is the norm here. Clearly my small cross body purse is lame. I took this to try and show how everyone looks very similar here. This sign is very common. 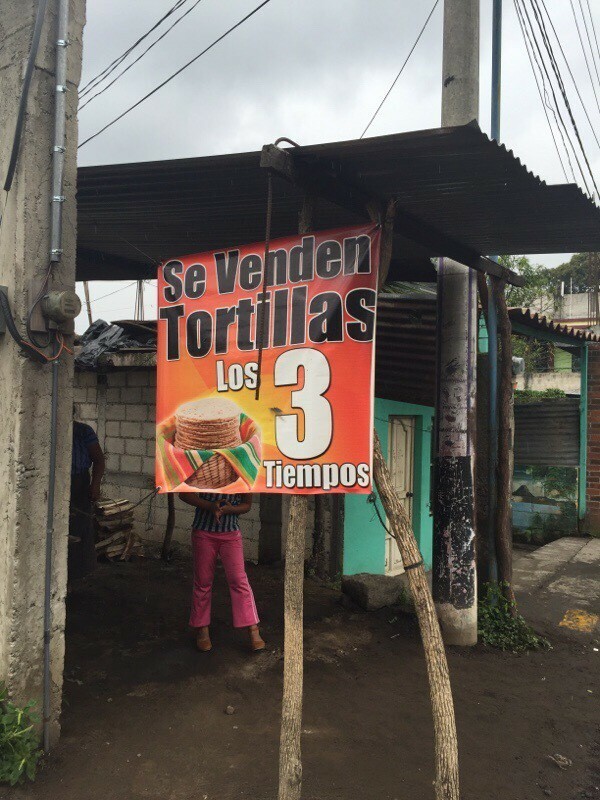 It essentially means “3 times a day we make fresh tortillas”. You can usually hear the “slap slap slap” of the person forming the tortilla. Their corn tortillas are thicker and smaller than in Mexico, but more common, which I did not think was possible but it is. 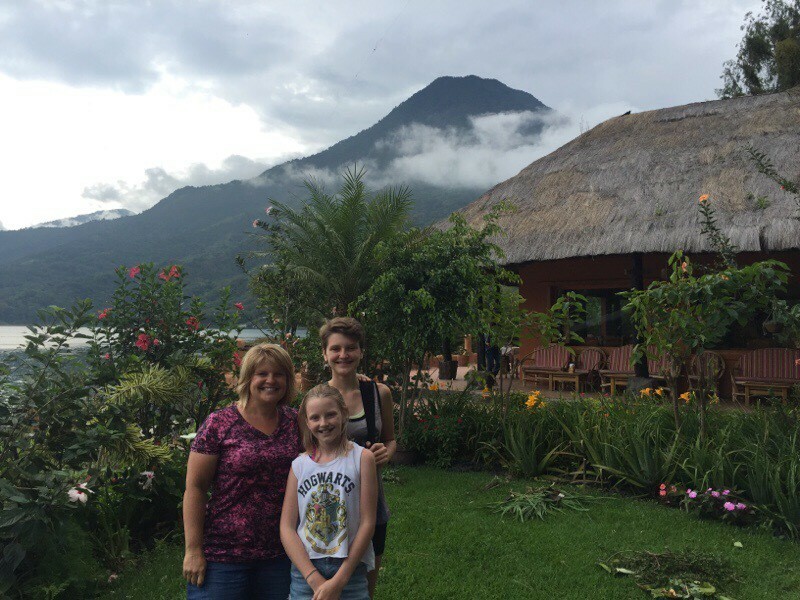 So here’s the bottom line: if you are ever in Guatemala and someone says “Oh you really should see Lake Atitlan” you can say “Yep, Allison said that too.” And when you go you’ll see I was right.